Jennie M's Stampin Spot: 2018 Occasions Catalog and Sale-a-bration Time! What a fun and vibrant card Jennie! 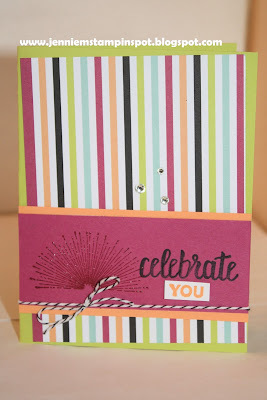 I love the bold stripes too and the way you've put so many fun, new products together to make such a happy card. Thanks for caseing me this week-you nailed it! I'm so glad you joined us for this week's challenge over at TGIF Challenges and I hope to see playing in the future. I am a sucker for stripes and its awesome to draw the eye into what you really want it to see (The sentiment). Love it and thanks for playing at TGIF!